U.S. Army Center of Military History Publication 104-4 (1986). 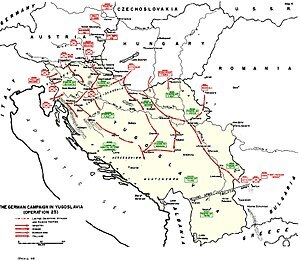 The German Campaign in the Balkans (Spring 1941). Militärverlag der Deutschen Demokratischen Republik (1977). Geschichte des Zweiten Weltkrieges Vol. 3, A. A.. Gretschko, Berlin. John Keegan (ed.) (1989). The Times Atlas of the Second World War. New York: Harper and Row. Goss, Chris. (2005). Dornier 17: In Focus. Surrey. UK: Red Kite Books. ISBN 0-9546201-4-3. ^ Tomasevich, Jozo (2001). War and Revolution in Yugoslavia 1941-1945: Occupation and Collaboration. Stanford, Cal. : Stanford University Press. ^ Weal, 1998 p. 25. ^ Goss 2005, p. 10. ^ Weal, 1998 p. 29.